I turned on the Belgium versus England group stage match only to learn that neither team would play their best players. Sure, both teams had already advanced to the knockout stage of the 2018 World Cup before this match. However, the team that wins the group would play Japan, the 36th ranked team by my predictive international soccer rankings. The second place team would face 9th ranked Colombia. It seemed like either England and Belgium could benefit from playing their top players against the opponent’s backups. I expressed my displeasure at the situation on Twitter. Plenty of people shot back with an important point: the first place team gets placed on the side of the bracket with Brazil, France and Argentina. The second place team does play Colombia but otherwise only has to deal with Spain. Belgium won 1-0 over England to win the group. But did they reduce their win probability by putting themselves on the difficult side of the bracket? In the actual bracket, here are the win probabilities for the remaining 16 teams in the World Cup based on The Power Rank’s analytics. I also ran numbers in which Belgium swapped places with England. What did I find? Belgium’s win probability increased by only 0.3% when placed on the “easier” side of the bracket. In over 50,000 simulations, the error in this win probability is 0.1%. The change in win probability is only slightly larger than this error. England’s win probability drops only 0.1% on the harder side of the bracket. They would however have an easier time getting to the quarterfinals. With the swap, England has a 61% chance to advance past Japan. In the actual bracket, they have a 47% chance against Colombia. The biggest change in win probability with the swap was Brazil. My numbers rank Belgium (4th) well ahead of England (11th). When Belgium swaps places with England, Brazil could not play Belgium in the quarterfinal, which results in a small increase of 0.4% in win probability. In 2004, Lasek and coworkers performed a study on which international football/soccer rankings best predicted matches. Among other results, they found a combination of rankings produced the best predictions. 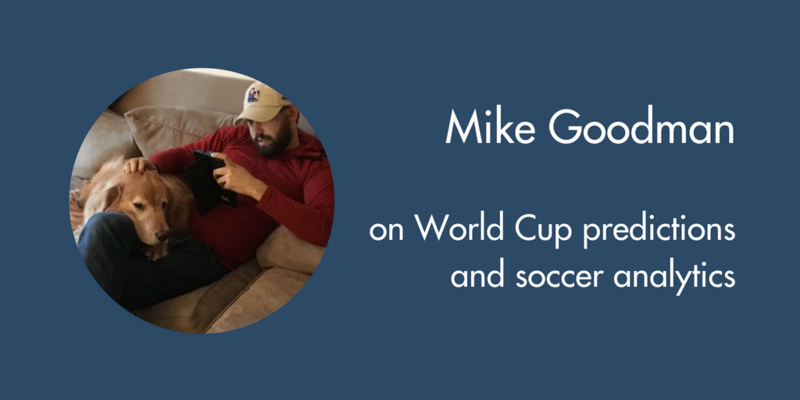 On this episode of The Football Analytics Show, I talk with Mike Goodman, a writer who explains the finer points of soccer analytics. His content has appeared on FiveThirtyEight, The Athletic and Grantland among other outlets, and he’s the managing editor at Stats Bomb. Mike does such an excellent job explaining the analytics, and I highly recommend listening to get up to speed on analytics before the World Cup. Historian Ron Chernow dominates the non-soccer part of the conversation that ends the show. To listen to the show in iTunes, click here. To listen to the show here, click on the right pointing triangle.